The Animal DNA Laboratory provides a 10% discount on DNA testing for all NSW CFA members. Please contact the Office for the Registration number which needs to be quoted to obtain the discount. A Feline Health Research Fund set up by the Co-ordinating Cat Council of Australia. Donations are tax deductible. The Winn Feline Foundation was founded by the Cat Fanciers' Association (CFA) in 1968 to create a source of funding for medical studies to improve the health and welfare of cats. The foundation was named to honour CFA's long-time attorney and advisor, Robert. H. Winn. 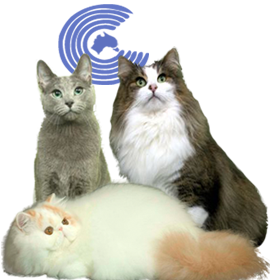 Cornell Feline Health Centre is a veterinary medical specialty centre devoted to improving the health and well-being of cats everywhere. Archived articles on feline health issues in research. General Feline information. Health and Breed info.